This is a new discovery of mine, or maybe simply a confirmation of what I already knew. You may not feel the same way, and that’s OK. I’m not right and you wrong. I’m not wrong and you right. They may simply be different. 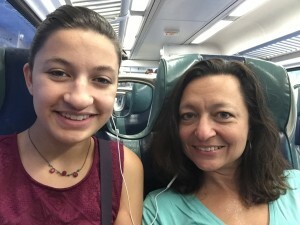 I went to New York City yesterday with my daughter to see a broadway show. It was a big surprise for her. She thought we were going in to the city to a special restaurant and it turned in to so much more. It was fun to sit with her on the train and share earbuds listening to music. It was great to see her so excited to be walking through the streets of New York City. It was wonderful to see her shock when she saw her aunt and niece on line for that special restaurant (pre-arranged by me). My heart overflowed with love to see her giddiness about going to see the show. This is where it all changed. In NYC, I felt so out of sync with who I truly am. I desired with my whole being to be in the woods, with dirt beneath my feet, surrounded by trees. I didn’t like the lines. I didn’t like the crowds. I didn’t like the over the top commercialism. I didn’t like the overdose of stimulation walking through Times Square. You see, during the past couple of years, I identified a new big juicy desire of mine. This desire is to feel grounded. According to the dictionary, grounded means: used to describe a person who is sensible and has a good understanding of what is really important in life. I don’t know if ‘sensible’ applies to me, but ‘understanding what is really important in life’ certainly resonates with me in a big way. My family is definitely a super high priority for me. This is exactly why I planned a spectacular day for my daughter. I realized yesterday how much I love the outdoors. I’m not referring to the walking around NYC kind of outdoors. I’m referring to the kayaking, tubing, hiking, walking, and sprinting kind of outdoors. I love to be in the delight of Mother Nature’s splendor. This is one of the ways I feel most grounded. I usually hike only on weekends, but I’m thirsty for a hike, so I’m going Wednesday evening. I can’t wait! What’s most important in your life? Do you live your life according to what’s most important? Please share an example. Previous What you think of me . . .